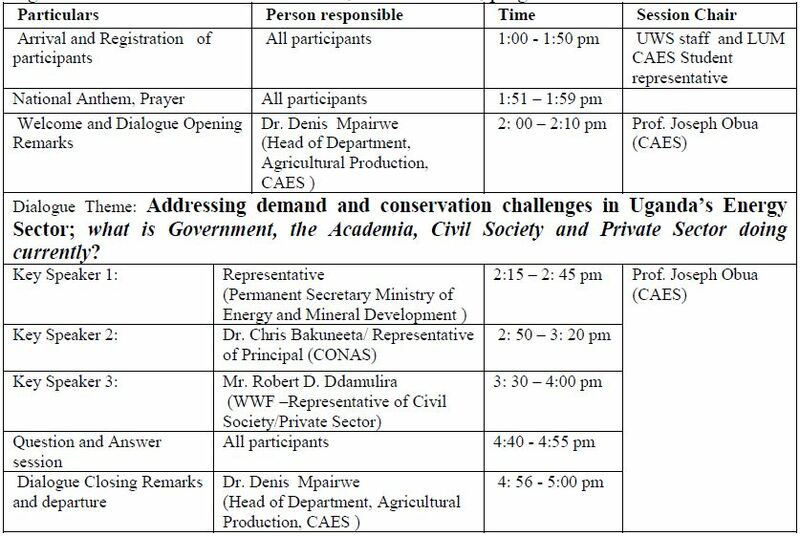 Invitation to a Policy dialogue – Addressing Demand and Conservation Challenges in Uganda’s Energy Sector; what is Government, Academia, Civil Society/Private Sector doing? 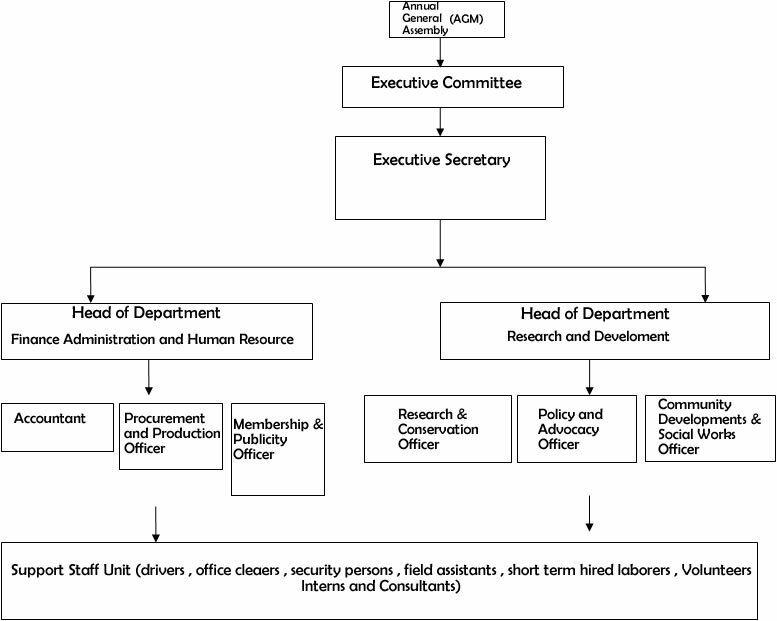 Re: Invitation to a Policy dialogue – Addressing Demand and Conservation Challenges in Uganda’s Energy Sector; what is Government, Academia, Civil Society/Private Sector doing? 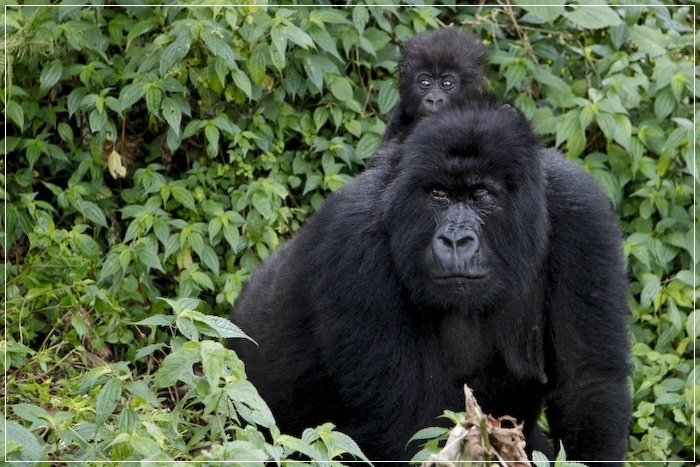 Addressing Energy demand and existing conservation challenges remain part of the most critical factors Uganda must as a matter of priority tackle in order to reach her vision 2040 of a ‘‘Transformed Ugandan Society from a Peasant to a Modern and Prosperous Country within 30 Years’’. This challenge requires action from all stakeholders and every Ugandan. Considering the challenge and towards her vision, Wildlife and Humans Living in Harmony and, within her mandate of promoting sustainable natural resource use and management through policy dialogues, advocacy, research and, community initiatives demonstrating linkages between conservation and people’s livelihoods, Uganda Wildlife Society (UWS) in collaboration with Makerere University’s Colleges of, Agriculture and Environmental Sciences (CAES), Natural Sciences (CONAS) and, Ministry of Energy and Mineral Development (MEMD) is convening a policy dialogue on Tuesday 24th November 2015 themed, Addressing demand and conservation challenges in Uganda’s Energy Sector; What is Government, Academia, Civil Society and Private Sector doing currently? The above dialogue aimed at stimulating interaction and debate amongst the Energy sector stakeholders and providing information for a report on what they are doing currently to address the themed challenge will also, enable University students offering related courses interact and hear from the practitioners about current issues in the field. Experts from Ministry of Energy and Mineral Development (representative of Permanent Secretary), Academia (Principal of CONAS or his representative) and Civil Society/ Private Sector (representative of World Wild Wide Fund for Nature (WWF) will give technical presentations precursor to general dialogue/debate. 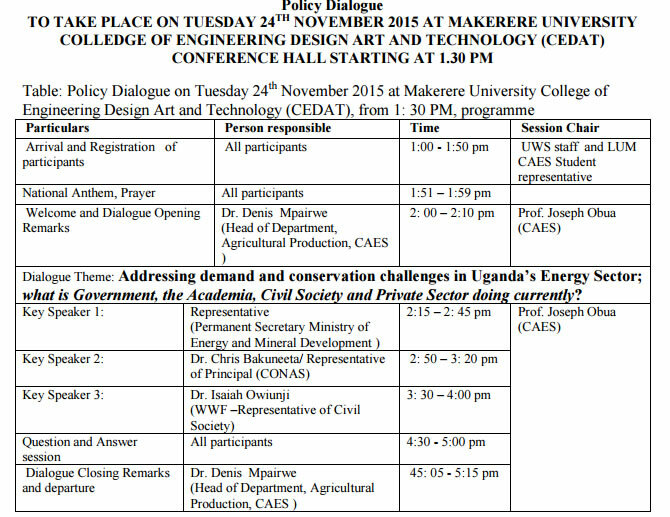 The purpose of this communication therefore is to invite you and in particular request that you participate in the public dialogue scheduled to take place at Makerere University’s College of Engineering Design Art and Technology (CEDAT) Conference Hall, Starting at 2:00 pm to 5:00 pm, on Tuesday 24th November 2015. For reference find the detailed programme in page 2. The Society thanks you for your continued support and engagement in her activities. Addressing Energy demand and existing conservation challenges remain part of the most critical factors Uganda must as a matter of priority tackle, in order to reach her vision 2040 of a transformed Ugandan Society from a Peasant to a Modern and Prosperous Country within 30 Years’’, and this challenge will require action from all stakeholders and every Ugandan. Considering this challenge, towards her vision Wildlife and Humans Living in Harmony and, within her mandate of promoting sustainable natural resource use and management through policy dialogues, advocacy, research and, community initiatives demonstrating linkages between conservation and people’s livelihoods, Uganda Wildlife Society (UWS) in collaboration with Makerere University’s Colleges of, Agriculture and Environmental Sciences (CAES), Natural Sciences (CONAS) and, Ministry of Energy and Mineral Development (MEMD) is convening a policy dialogue on Tuesday 24th November 2015 at Makerere University College of Engineering, Design, Art and Technology(CEDAT) Conference Hall themed, Addressing demand and conservation challenges in Uganda’s Energy Sector, What is Government, Academia, Civil Society and Private Sector doing currently? The dialogue aimed at stimulating interaction and debate amongst the Energy sector stakeholders and providing information for a report on what they are doing currently to address the themed challenge, will also enable University students offering related courses interact and hear from practitioners about current issues in the field. Experts from Ministry of Energy and Mineral Development (a representative of the Permanent Secretary), the Academia (Principal of CONAS or his representative) and Civil Society/ Private Sector – an Official from Wild Wide Fund for Nature (WWF) will give technical presentations after which the general dialogue/debate will follow. The purpose of this communication therefore is to invite you and in particular request that you participate in the public dialogue scheduled to take place at Makerere University School of Agricultural Sciences, starting at 2:00 pm to 5:00 pm, on Tuesday 24th November 2015. For reference please find the detailed programme below. 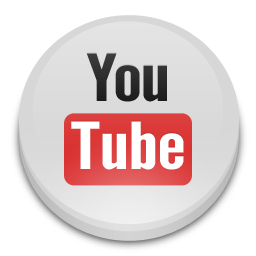 The Society in advance thanks you for your continued support and engagement in her activities.